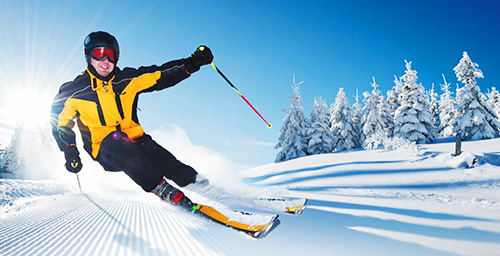 What better way to get in on the action than with an adrenaline pumping ski and sport holiday. Take in steep alpine landscapes or cheer on your favourite athletes at exclusive sporting venues around the globe. Whether you’ve never skied before or are a seasoned pro, a holiday that takes you to some of the most sought after alpine destinations is sure to enchant. Escape to the slopes of Italy, Austria, Switzerland and France and disappear into a European winter wonderland. Or, get extreme on the steep peaks of Japan, America and Canada. From thrilling downhill slopes, magical glacier heli-skiing, rad snowboard parks and everything in between, a ski getaway is a once in a lifetime opportunity. Fun for the whole family, everyone will love an alpine holiday even if they don’t want to ski. From magical wintery villages nestled against the mountain to the crisp quiet of a nature walk, snowshoeing, snowmobiling or helping your kids make their very own igloo, there’s always something exciting to do. Let one of our ski enthusiasts at Flight Centre help you plan the ultimate winter holiday. Live for the moment and watch your favourite athletes and teams compete in some of the toughest tournaments in the world. If you dream of watching your favourite soccer team scoring a goal, or experiencing the drama of Formula 1 first hand, a sporting holiday is a great bonding experience for family and friends. So show your support and get your teams jersey on, sit down with one of our Flight Centre sport event experts and let us take you to the heart of all the action!